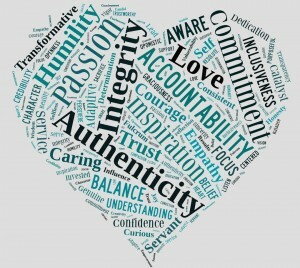 When I asked the 23,000 members of the Wholehearted Leadership group on LinkedIn what one word best describes wholehearted leadership, I was surprised by the answers. 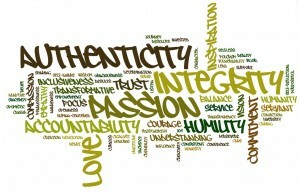 Authenticity – This word didn’t surprise me as it gets to the core of wholeheartedness. Being true to one’s own personality, and to one’s strengths and limitations, is the key to authentic leadership. For more on authentic leadership, see my Forbes article here. Integrity – I also expected to see integrity listed as a common response. Regardless of the type of leadership being discussed, most agree that integrity—the quality of being honest and having strong moral principles—is the foundation that all other leadership traits stand on. Interestingly, a secondary definition of Integrity is the state of being “whole” or undivided; that’s a remarkable fit for wholehearted leadership. Passion—I was surprised to see passion tied for first place on the list. While having strong emotions and being able to generate enthusiasm is certainly an archetype for the classic leader-as-hero, I thought this wouldn’t come top of mind for wholeheartedness. This is a good reminder that being a passionate leader doesn’t mean being a loud leader; and that you can have strong emotions regardless of your leadership type. Love was the answer given next most frequently. Again I was surprised, but pleasantly so. It’s nice to see so many corporate leaders who view love as a worthwhile leadership trait, and who aren’t afraid to share that viewpoint publicly on LinkedIn. There were a wide range of additional words suggested to encapsulate wholehearted leadership including: Accountability, Humility, Commitment, Trust, and Service. Being a wholehearted leader encompasses all of these things and more. What does wholehearted leadership mean to you? Check out Kevin Kruse’s new eCourse, Leading For Employee Engagement, and discover how leaders turn apathetic groups into emotionally committed teams.